On July 5, head to your local B&N for a lively discussion about Outlander, the blockbuster time-traveling saga featuring Claire, a World War II-era nurse, and her two husbands: Frank, an M16 officer, and Jamie, an 18th-century Scotsman. We want to hear all of your thoughts on this series and its Starz adaptation. How did you first discover the book? What are your thoughts about the TV show? What do you love about Diana Galbadon’s writing? Is time travel really plausible? And if so, what time period and location would you transport yourself to? Come on in to discuss these questions and more, and to test yourself with a trivia quiz. Also, enter for a chance to win an Outlander prize pack consisting of Outlander Season 1, Volume 1, a copy of the Outlandish Companion, and an Outlander Starz poster. In addition to the in-store experience, we’re thrilled to announce a special Twitter Chat with Outlander author Diana Gabaldon that is scheduled for Sunday, July 5, at 2pm EST. Customers are encouraged to join in @BNBuzz on Twitter or use #BNOutlanderChat to participate. Here’s how it works: Starting 6/25, fans can tweet their Outlander questions to Diana Gabaldon using #BNOutlanderChat. Barnes & Noble’s social media team will deliver those questions directly to the author who will answer a selection of them during her live chat on July 5. Tweet your questions now! 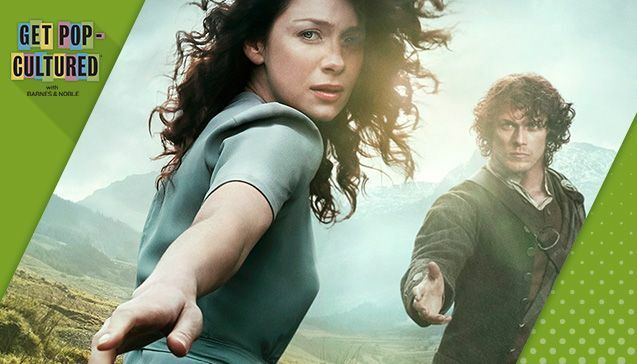 Also, on Sunday, July 5 ONLY—download Season One, Episode 1 of OUTLANDER (“Sassenach”) FREE on NOOK Video. FIND YOUR LOCAL B&N WITH EVENTS HERE! And pass the word around!